The problem with buying premade equipment is that it can get expensive for what it is, and it rarely does everything you want. In this case, we’re talking about backpacking cookware. When it comes to backpacking, you want something lightweight, multifunctional, and durable. 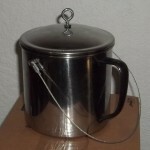 Basically, all you need is a simple thin-walled metal pot with a wire handle and a basic lid. Should be the simplest thing in the world, right? There is no reason at all that this should cost more than some fancy super-ceramic triple-nonstick multi-metal insulated-handle kitchenware. Yet it often does, and thus I have a project to do and an article to write about it. This is a 1.5L stainless steel mug that I got for $8 or $9 at a local Asian grocery store (branded “Myland”, haven’t found them anywhere online, but I’ve seen similar on eBay). I replaced the plastic lid handle with an eye bolt, so it can’t melt and should make it easy to remove with a stick or pliers if it’s hot. Due to the simplicity of the lid, also stainless steel, it can be turned over and used a like a skillet; just let the eye bolt poke down into the coals or through your grill . Also, it can serve as a plate. I drilled holes on either side of the pot and crimped loops onto the ends of a foot of the thinnest cable that Ace Hardware sells. Bolted it together, and the assembly made for a flexible and durable handle that can take abuse. I measured out water levels to 6 cups at 1-cup increments and to 1500ml at 250ml increments. I used some steel stamps to mark these levels so that I can see them from the inside as I work with liquid, and the pot can double as a field measuring cup. The handle is black because I had painted the pot’s exterior with Rust-Oleum high heat enamel to improve heat transfer, but it chipped too much for my liking and I scraped most of it off. I may try some other things later to get the same effect, and will update here if I do. 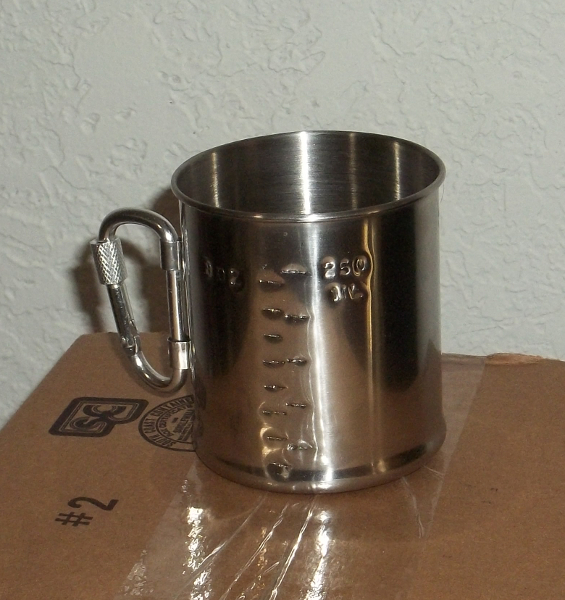 I also marked off a little Magellan 10oz stainless steel mug that I got for $3 on sale at Academy. I’m very happy with this setup; it does more for me than any of the pre-made offerings I’ve seen, while costing less. 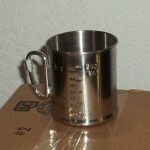 The pot weighs 12.3oz, and the cup is 1.9oz. 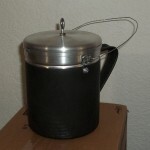 Last picture is an Imusa aluminum grease dipsenser from Walmart. I gave the lid an eye bolt handle, bolted on some picture-hanging swivels to attach a wire to hang the pot, and this one still has the Rustoleum paint on it. The paint seems to hold better on the aluminum’s brushed surface, so it can stay. Weight is 8.8oz. 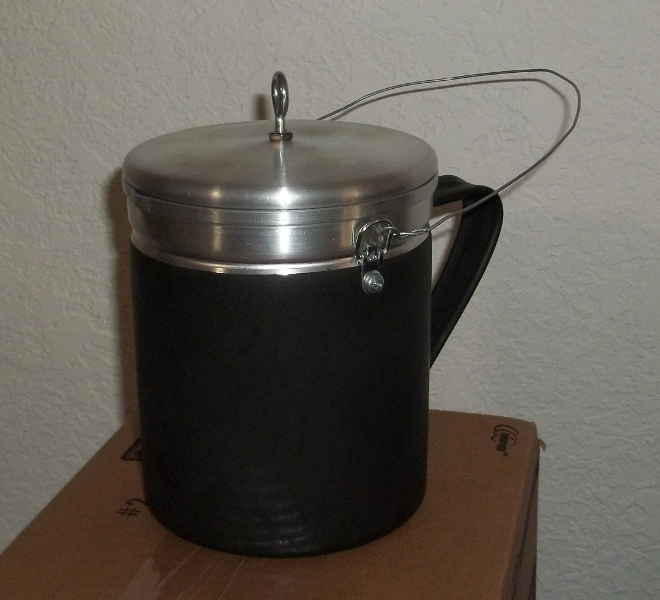 This aluminum pot was what I used before I found the stainless mug at the Asian mart. 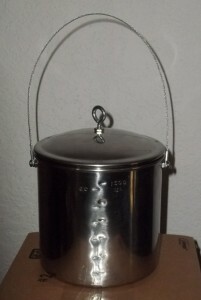 I prefer the stainless pot for my INCH bag because it is more durable, resistant to acidic foods, and can tolerate being used to boil ashes in the process of creating lye soap. The aluminum is just for recreation, now. Okay, that’s all I’ve got. Thanks for reading. Hope I stirred up some ideas for you.